President-elect Donald Trump has threatened to upend America's trading relationships, especially with China, Mexico and Canada. 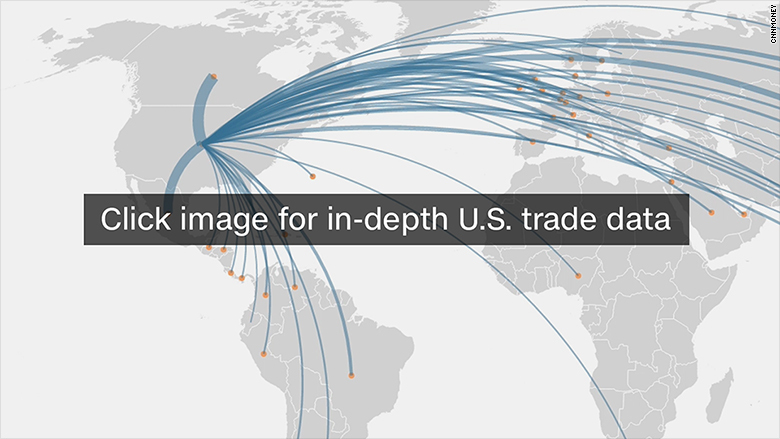 The stakes are huge: A CNNMoney analysis of official trade data shows the three countries do $1.9 trillion in combined trade with the U.S. each year, which is a major chunk of America's $5 trillion in global annual trade. To put that in perspective, if you stacked 1.9 trillion $1 bills on top of each other, the pile would reach about half way to the moon. Trump has promised to renegotiate or withdraw from NAFTA -- a free trade deal between the U.S., Canada and Mexico -- and he's threatened to slap tariffs of 45% on Chinese goods. He also said this month he'd introduce high taxes on U.S. companies that move jobs to Mexico. It's too early to say whether Trump will follow through on his promises. But there's little doubt that doing so would have a massive effect on trade around the world. 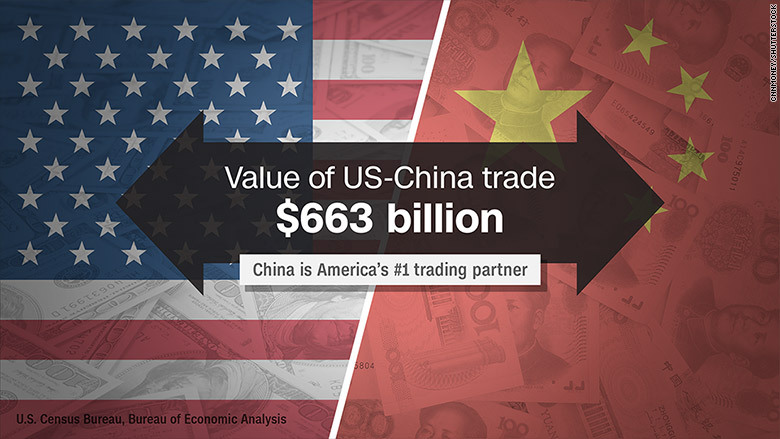 China is America's largest trading partner, with annual trade in goods and services worth about $663 billion. Chinese exports to the U.S. totaled nearly $500 billion in 2015 -- more than any other destination. 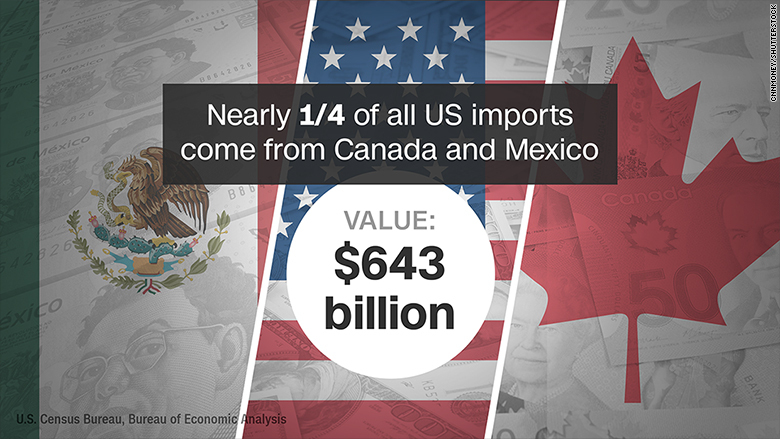 The value of U.S. trade with Canada is $662 billion, just a smidge less than China. Canada is the largest market for U.S. exports, taking in 15% of America's goods and services, worth $337 billion annually. 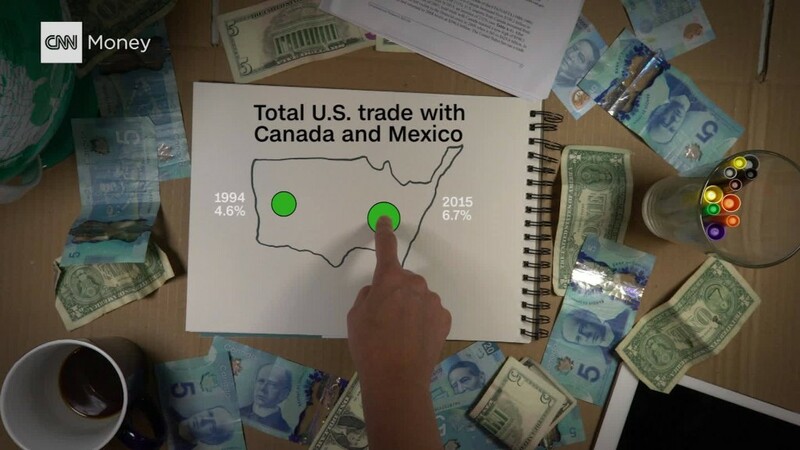 Mexico ranks as America's third biggest trading partner, worth $586 billion. Japan, Germany, the United Kingdom and South Korea round out the next spots. Their combined trade with the U.S. is worth $884 billion per year, significantly more than China. Many nations count on Americans to buy their products. For example, over 60% of all Canadian trade is done with the U.S., according to data from the World Trade Organization. And it takes in over 80% of all Mexican goods. The U.S. is also the top destination for British and German exports.